Procol Harum is arguably the most successful “accidental” group creation — that is, a band originally assembled to take advantage of the success of a record created in the studio — in the history of progressive rock. With “A Whiter Shade of Pale” a monster hit right out of the box, the band evolved from a studio ensemble into a successful live act, their music built around an eclectic mix of blues-based rock riffs and grand classical themes. With singer/pianist Gary Brooker and lyricist Keith Reidproviding the band’s entire repertory, their music evolved in decidedly linear fashion, the only major surprises coming from the periodic lineup changes that added a new instrumental voice to the proceedings. At their most accessible, as on “A Whiter Shade of Pale” and “Conquistador,” they were one of the most popular of progressive rock bands, their singles outselling all rivals, and their most ambitious album tracks still have a strong following. Procol Harum‘s roots and origins are as convoluted as its success — especially between 1967 and 1973 — was pronounced. Pianist Gary Brooker (b. May 29, 1945, Southend, Essex, England) had formed a group at school called the Paramounts at age 14, with guitarist Robin Trower (b. Mar. 9, 1945, Southend, Essex) and bassist Chris Copping (b. Aug. 29, 1945 Southend, Essex), with singerBob Scott and drummer Mick Brownlee. After achieving a certain degree of success at local youth clubs and dances, covering established rock & roll hits, Brooker took over the vocalist spot from the departed Scott, and the group continued working after its members graduated — by 1962, they were doing formidable (by British standards) covers of American R&B, and got a residency at the Shades Club in Southend. Brownlee exited the band in early 1963 and was replaced by Barry J. (B.J.) Wilson (b. Mar. 18, 1947, Southend, Essex), who auditioned after answering an ad in Melody Maker. Nine months later, in September of 1963, bassist Chris Copping opted out of the professional musicians’ corps to attend Leicester University, and he was replaced by Diz Derrick. The following month, the Paramounts demo record, consisting of covers of the Coasters‘ “Poison Ivy” and Bobby Bland‘s “Farther on up the Road,” got them an audition at EMI. This resulted in their being signed to the Parlophone label, with their producer, Ron Richards, the recording manager best-known for his many years of work with the Hollies. The Paramounts’ first single, “Poison Ivy,” released in January of 1964, reached number 35 on the British charts. The group also got an important endorsement from the Rolling Stones, with whom they’d worked on the television show Thank Your Lucky Stars, who called the Paramounts their favorite British R&B band. Unfortunately, none of the group’s subsequent Parlophone singles over the next 18 months found any chart success, and by mid-’66, the Paramounts had been reduced to serving as a backing band for popsters Sandy Shaw and Chris Andrews. In September of 1966, the Paramountswent their separate ways; Derrick out of the business, Trower and Wilson to gigs with other bands, and, most fortuitously, Gary Brooker decided to develop his career as a songwriter. This led Brooker into a partnership with lyricist Keith Reid (b. Oct. 19, 1945), whom he met through a mutual acquaintance, R&B impresario Guy Stevens. By the spring of 1967, they had a considerable body of songs prepared and began looking for a band to play them. An advertisement in Melody Maker led to the formation of a band initially called the Pinewoods, with Brooker as pianist/singer, Matthew Fisher (b. Mar. 7, 1946, Croydon, Surrey) on organ, Ray Royer (b. Oct. 8, 1945) on guitar, Dave Knights (b. June 28, 1945, London) on bass, and Bobby Harrison (b. June 28, 1943, London) on drums. Their first recording, produced by Denny Cordell, was of a piece of surreal Reid poetry called “A Whiter Shade Of Pale,” which Brooker set to music loosely derived from Johann Sebastian Bach‘s Air on a G String from the Suite No. 3 in D Major. 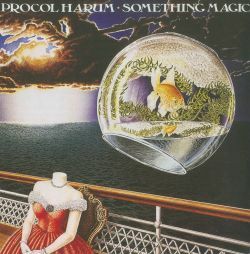 By the time this recording was ready for release, the Pinewoods had been rechristened Procol Harum, a name derived, as alternate stories tell it, either from Stevens‘ cat’s birth certificate, Procol Harun, or the Latin “procul” for “far from these things” (hey, it was the mid-’60s, and either is possible). In early May of 1967, the group performed “A Whiter Shade of Pale” at the Speakeasy Club in London, whileCordell arranged for a release of the single on English Decca (London Records in America), on the companies’ Deram label. Ironically, Cordell‘s one-time clients the Moody Blues were about to break out of a long commercial tail-spin on the very same label with a similar, classically-tinged pair of recordings, “Nights in White Satin” and “Days of Future Passed,” and between the two groups and their breakthrough hits, Deram Records would be permanently characterized as a progressive rock imprint. Cordell had also sent a copy of “A Whiter Shade of Pale” to Radio London, one of England’s legendary off-shore pirate radio stations (they competed with the staid BBC, which had the official broadcast monopoly, and were infinitely more beloved by the teenagers and most bands), which played the record. Not only was Radio London deluged with listener requests for more plays, but Deram suddenly found itself with orders for a record not scheduled for release for another month — before May was half over, it was pushed up on the schedule and rushed into shops. 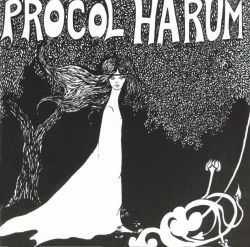 Meanwhile, the prototypal Procol Harum made its concert debut in London opening for Jimi Hendrixat the Saville Theater on June 4, 1967. Four days later, “A Whiter Shade of Pale” reached the top of the British charts for the first of a six-week run in the top spot, making Procol Harum only the sixth recording act in the history of British popular music to reach the number one spot on its first release (not even the Beatles did that). The following month, the record reached number five on the American charts, with sales in the United States rising to over a million copies (and six million copies worldwide). All of this seemed to bode well for the band, except for the fact that it had only a single song in its repertory and no real stage act — literal one-hit wonders. The same month that the record peaked in the United States, Royer and Harrison were sacked and replaced by Brooker‘s former Paramountsbandmates Robin Trower and B.J. Wilson on guitar and drums, respectively. 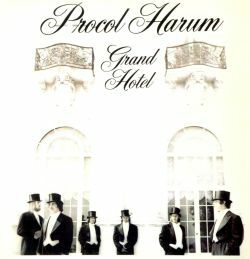 The “real” Procol Harum band was now in place and a second single, “Homburg,” was duly recorded. Reminiscent of “Whiter Shade of Pale” in its tone of dark grandeur, this single, released in October of 1967 on EMI’s Regal Zonophone label, got to number six on the British charts. The group’s debut album, entitled Procol Harum, managed to reach number 47 in America during October of 1967, based on “A Whiter Shade of Pale” being among its tracks (which included the first version of “Conquistador”) — but a British version of the LP, issued over there without the hit, failed to attract any significant sales. The single “Homburg,” however, got no higher than number 34 in America a month later. On March 26, 1968, “A Whiter Shade of Pale” won the International Song of the Year award at the 13th Annual Ivor Novello Awards (sort of the British equivalent of the Grammys). The group’s newest single, “Quite Rightly So,” however, only reached the number 50 spot in England in April of that year. A new contract for the group was secured with A&M Records in America (they remained on Regal Zonophone in England), and by November, a second album,Shine on Brightly, highlighted by an 18-minute epic entitled “In Held ‘Twas I,” was finished and in the stores, and rose to number 24 in America but failed to chart in England. The next month, they were playing the Miami Pop Festival in front of 100,000 people, on a bill that includedChuck Berry, Canned Heat, the blues version of Fleetwood Mac, and the Turtles, among others. In March of 1969, David Knights and Matthew Fisher exited the lineup shortly after finishing work on the group’s new album, A Salty Dog, preferring management and production to the performing side of the music business. Knights‘ departure opened the way for bassist Chris Copping to joinProcol Harum (thus re-creating the lineup of the Paramounts), playing bass and organ. 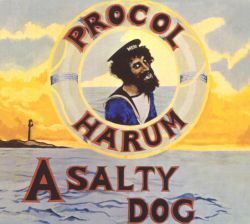 Another American tour followed the next month, and in June of 1969 A Salty Dog was issued. This record, considered by many to be the original group’s best work, combined high-energy blues and classical influences on a grand scale, and returned the band to the U.S. charts at number 32, while the title song ascended the British charts to number 44. The album subsequently reached number 27 in England, the group’s first long-player to chart in their own country.Despite the group’s moderate sales in England and America, they remained among the more popular progressive rock bands, capable of reaching more middle-brow listeners who didn’t have the patience for Emerson, Lake & Palmer or King Crimson. Robin Trower‘s flashy guitar quickly made him the star of the group, as much as singer/pianist Brooker, and he was considered in the same league with Alvin Lee and any number of late-’60s/early-’70s British blues axemen. Matthew Fisher‘s stately, cathedral-like organ had been a seminal part of the band’s sound, juxtaposed with Trower‘s blues-based riffing and Reid‘s unusual, darkly witty lyrics as voiced by Brooker. Following Fisher‘s departure, the group took on a more straightforward rock sound, but Trower‘s playing remained a major attraction to the majority of fans. “Whaling Stories” was an example of quintessential Procol Harum, a mix of 19th century oratorio that sounds like it came out of a Victorian-era cathedral, with fiery blues riffs blazing at its center. And being soaked in Reid‘s dark, eerie, regret-filled lyrics didn’t stop “A Salty Dog” from becoming one of the group’s most popular songs. It was a year before their next album, Home, was released, in June of 1970, ascending to the American number 34 and the British 49 spot. This marked the end of the group’s contract with Regal Zonophone/EMI, and on the release of their next LP in July of 1971, they were now on Chrysalis in England.Broken Barricades reached number 32 in America and 41 in England, but it also marked the departure of Robin Trower. The founding guitarist left that month and subsequently organized his own group, with a sound modeled along lines similar to Jimi Hendrix, which had great success in America throughout the 1970s.Trower‘s replacement, Dave Ball (b. Mar. 30, 1950), joined the same month, and the lineup expanded by one with the addition of Alan Cartwright on bass, which freed Chris Copping to concentrate full-time on the organ. The group returned to something of the sound it had before Fisher‘s departure, although Trower was a tough act to follow. 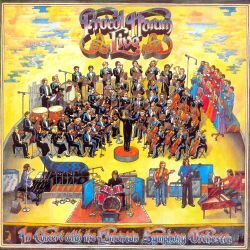 It was this version of the band that performed on November 18, 1971 in a concert with the Edmonton Symphony Orchestra and the DaCamera Singers in Edmonton, Alberta, Canada — the concert was a bold and expansive, richly orchestrated re-consideration of earlier material (though not “A Whiter Shade of Pale”) from the group’s repertory, and, released as an official live album in 1972, proved to be the group’s most successful LP release, peaking at number five and drawing in thousands of new fans. Amid all of this success, the group’s lineup again was thrown into turmoil in September when Dave Ball left Procol Harumto join Long John Baldry‘s band. He was replaced by Mick Grabham, formerly of the bands Plastic Penny and Cochise. The band’s next album, Grand Hotel, was a delightfully melodic and decadent collection (anticipating Bryan Ferryand Roxy Music in some respects) that featured guest backing vocals by Christianne Legrand of the a cappella singing group the Swingle Singers. That record, their first released on Chrysalis in America as well as England, peaked at number 21. 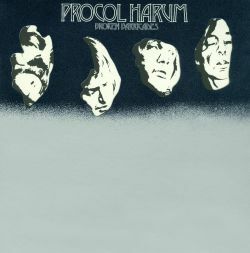 Six months later, A&M released the first compilation of the band’s material, Best of Procol Harum, which only made it to number 131 on the charts. 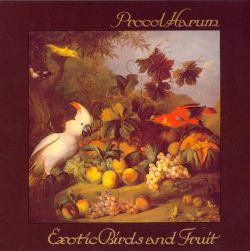 The group’s next two albums, Exotic Birds and Fruit (May 1974) and Procol’s Ninth (September 1975), the latter produced by rock & roll songsmiths Jerry Leiber and Mike Stoller, performed moderately well, and “Pandora’s Box” fromProcol’s Ninth became one of their bigger hits in England, rising to number 16. July of 1976 saw a departure and a lateral shift in the group’s lineup, as Alan Cartwright left the band and Chris Copping took over on bass, while Pete Solley joined as keyboard player. By this time, the band’s string had run out, as everyone seemed to know. A new album,Something Magic, barely scraped the U.S. charts in April of 1977, and the band split up following a final tour and a farewell concert at New York’s Academy of Music on May 15, 1977. Only five months later, the band was back together for a one-off performance of “A Whiter Shade of Pale,” which had taken on a life of its own separate from the group — the song was named joint winner (along with “Bohemian Rhapsody”) of the Best British Pop Single 1952-1977, at the Britannia Awards to mark Queen Elizabeth II’s Silver Jubilee, and the band performed it live at the awards ceremony. 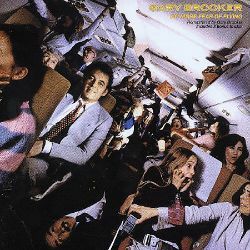 Apart from Trower, Gary Brooker was the most successful and visible of all ex-Procol Harum members, releasing three solo albums between 1979 and 1985. No More Fear of Flying (1979) on Chrysalis, produced by George Martin, attracted the most attention, but Lead Me to the Water (1982) on Mercury had some notable guest artists, including Eric Clapton and Phil Collins, while Echoes in the Night (1985) was co-produced by Brooker‘s former bandmate Matthew Fisher. During the late ’80s, however, Brooker had turned to writing orchestral music, principally ballet material, but this didn’t stop him from turning up as a guest at one of the annualFairport Convention reunions (Procol Harum and Fairport had played some important early gigs together) at Cropredy, Oxfordshire, in August of 1990 to sing “A Whiter Shade of Pale.”Still, Procol Harum had faded from the consciousness of the music world by the end of the 1980s. The death of B.J. Wilson in 1990 went largely unreported, to the chagrin of many fans, and it seemed as though the group was a closed book. 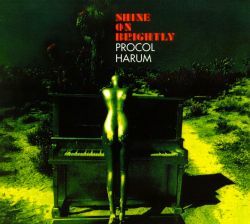 Then, in August of 1991, Brooker re-formed Procol Harum with Trower, Fisher, Reid, and drummerMark Brzezicki. An album, Prodigal Stranger, was recorded and released, and an 11-city tour of North America took place in September of 1991. Although this lineup didn’t last — Trower and company, after all, were pushing 50 at the time — Brooker has kept a new version of Procol Harum together, in the guise of himself, guitarist Geoffrey Whitehorn, keyboardman Don Snow, and Brzezicki on drums, which toured the United States in 1992.